New York, May 5, 2017 –This year, Corona Extra, the #1 Mexican beer that’s long-been synonymous with Cinco de Mayo celebrations, is stepping up celebrations nationwide with out-of-the-box executions and the brand’s biggest-ever investment for the occasion. This year, the brand will continue its “Lime Drop” campaign with a complete 360° marketing plan including national TV and digital advertising, social media, PR and retail programming. To bring Corona’s campaign to life, the brand has partnered with Transformers actor Josh Duhamel for a kick-off party in New York City, where he will help ring in Cinco de Mayo with a larger-than-life “Lime Drop.” For the first time ever outside of New Year’s Eve, the city’s iconic Times Square Ball will be lit up to resemble a lime wedge and dropped for the celebration. 2017 marks the Corona Extra brand’s 20th year as the nation’s #1 imported beer. This year the brand is starting its Cinco celebrations in New York City, one of the top beer markets in U.S., where Corona Extra is the #1 beer overall. As a part of the marketing efforts, Corona has also developed a second year of its social media #LimeDrop campaign, including a Snapchat lens, which will be released to a twenty-one (21) plus audience nationwide on Cinco de Mayo. In 2016, Corona was the #1 alcohol brand on Facebook and Instagram for the month of May and topped the list of brands detected in #CincodeMayo photos on Instagram with more than 6X as many tags as the next closest brand. 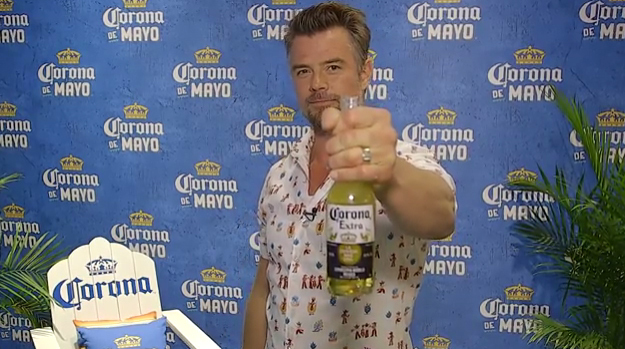 Corona is also running a Cinco de Mayo-themed TV spot nationwide in the weeks leading up to May 5 – its biggest Cinco TV investment to-date – to remind everyone to get ready for the fiesta. Constellation Brands, the exclusive brewer, importer and marketer of Corona for the U.S. market, will also ring the closing bell at the New York Stock Exchange on May 5. In 2016, the company was the #1 growth contributor at retail and the #1 growth contributor in the U.S. beer industry, thanks in large part to record-breaking sales of Corona Extra. For more information on Corona Extra, please visit CoronaExtraUSA.com, or follow the brand on Twitter, Instagram and Facebook. To join the Cinco de Mayo fiesta, share your #LimeDrop moment on Instagram or Twitter. Corona Extra is a pilsner-style lager with a golden hue that has been brewed in Mexico since 1925. The refreshing flavor and carefree attitude of Corona have made it the #1 imported beer in the U.S. and the #5 beer brand overall. Corona has been helping consumers “Find their Beach” in the U.S. since 1981. The brand posted a record-breaking year in 2016. Constellation Brands (NYSE: STZ and STZ.B), a Fortune 500® company, is a leading international producer and marketer of beer, wine and spirits with operations in the U.S., Mexico, New Zealand, Italy and Canada. Constellation is the No. 3 beer company in the U.S. with high-end, iconic imported brands such as Corona Extra, Corona Light, Modelo Especial, Modelo Negra and Pacifico. The company's beer portfolio also includes Ballast Point, one of the most awarded craft brewers in the U.S. In addition, Constellation is the world leader in premium wine, selling great brands that people love, including Robert Mondavi, Clos du Bois, Kim Crawford, Meiomi, Mark West, Franciscan Estate, Ruffino and The Prisoner. The company's premium spirits brands include SVEDKA Vodka, Casa Noble Tequila and High West Whiskey.